Quick unofficial parts with LDView. 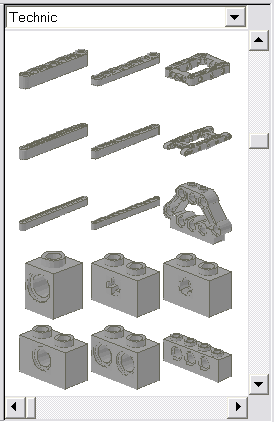 Following Jetro's great article about grabbing parts from the LDraw Parts Tracker, I'd like to make a small addition. One of the programs in the LDraw Installer you can choose to install is LDView, a fast 3D viewer for LDraw files. However, the version included is quite old, and it's better to avoid installing it, and instead choose the separate, newest version from its site. Why do this? Because the newer versions have, among other nifty stuff, a very useful feature: automatic part downloading. So, what does it do? In a nutshell, LDView tries to download from the Parts Tracker anything you require to view a model and you don't already have. 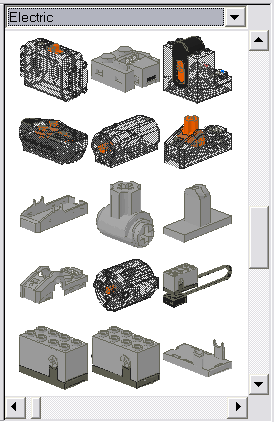 LDView parts downloads go in the "Unofficial" folder. But, like Jetro wrote, if you want to use them in your models, you'll have to do some text editing. 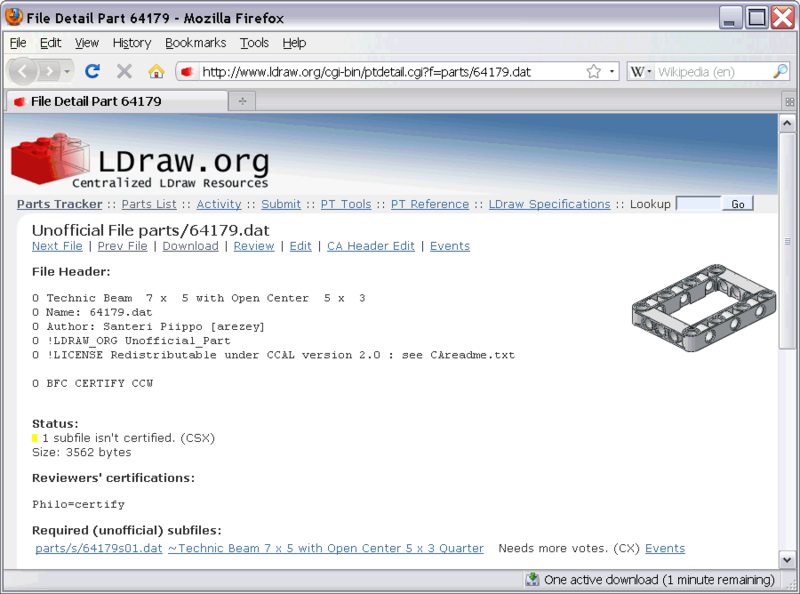 Since some MLCad installations don't include the "MLCad.ini" file, you may download the latest version from Holly-Wood's site (by the way, there you can also find another great tutorial about configuring MLCad for unofficial parts). 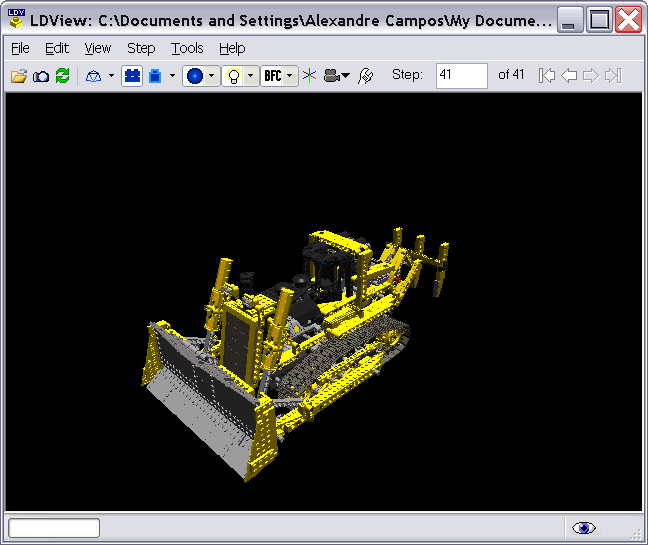 Then, once you have the file, you can do the editing to tell MLCad to search for parts in the "Unofficial" folder. Once you have the file set up, you may save it and close it. Now, all you need is to download, install and run LDView. You can then tinker with the settings, but the defaults will do nicely for downloading parts you need. When LDView opens a file that requires a part that isn't already on your computer, it will try to download it, as well as anything that part requires. Notice the bottom-left corner on this screenshot. There you go! Now, if you open MLCad (if you already had it open, you'll have to close it and open it again for it to re-scan the parts folders), you'll see the new part(s), waiting to be used in other models you create. Note that, if LDView tries to download something and it can't (your Internet connection is down, for example), it disables the automatic part downloading, and you have to re-enable it again. If you want to be able to use a part that isn't already in an LDraw file you have, the process is a little bit trickier: you'll still have to find the part yourself on the Parts Tracker and download it to the "Unofficial" folder. 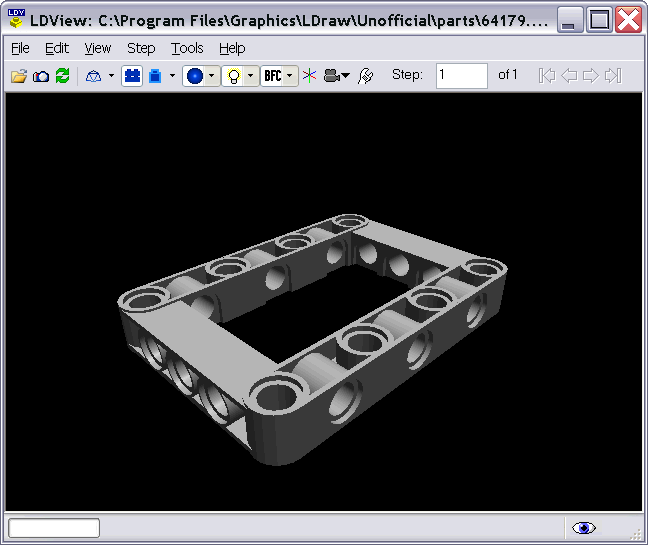 Only then you can use LDView to open the part file as you open any other LDraw file to get anything else it might need. Let's suppose I want to reproduce the die Fernando told us about. For that, I'll need the new small frame, which (at the time I'm writing this), still isn't an official part. 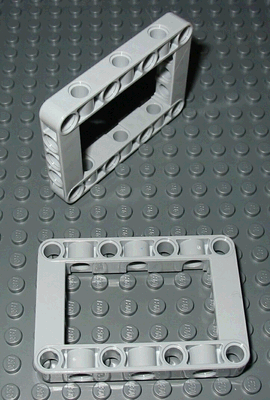 First, if I don't already know the part number, I try to search for a LEGO set that uses it. The 8265 Front Loader has it, so I go to its inventory on Peeron, and note the part number: 64179. Then I go to the Parts Tracker and search for this reference. 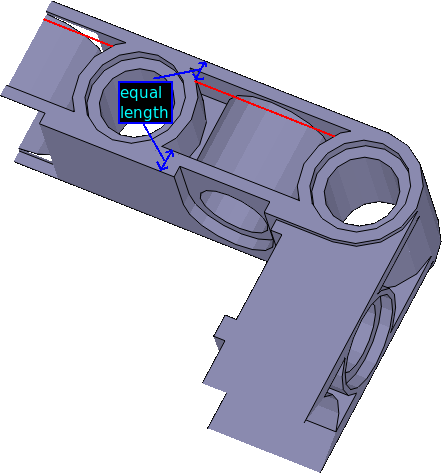 Luckily, Santeri Piippo already modelled this part and uploaded it to the Parts Tracker. The part page reports that it needs other unofficial sub-parts, which in turn may need yet more sub-parts, and so on. But I don't need to worry about all that: that's LDView's job. I click "Download", and then choose the "Unofficial\Parts" folder, the one that was configured in the "MLCad.ini" file earlier. Next, I open the part in LDView. It reports it's trying to download all the necessary sub-parts and saving them in the right places. When it finishes, it shows the finished part. Now, what happens when I run MLCad? Voilà, the frame is there, all ready for some serious virtual building! Let's see what comes out of your virtual beams and gears! Thanks for the addition. It can be very annoying to open an ldr file and have MLCad complain about multiple missing parts. This is a quick and easy solution to that problem as well as for making sure you get all the necessary subfiles for a new part you import from the tracker. I hope that if we ever get an update to MLCad it will include a similar function. It feels great to get one of my parts featured here on TBs - it sure gives you the feeling that you didn't sacrifice those hours and hours of time for nothing. :-) However, my name is written incorrectly - it is Santeri Piippo, not Santero Piipo. Alexandre wrote the name wrong, but I fixed it for you now. One more thing that hasn't come up yet is the PT activity log which acts like Recent Changes on wikis. It's basically the answer to the question "Hi Tracker! what's up?" - it shows all recent activity on the PT. If you keep an eye on it regularly, you'll for example know what parts will end up in the next release (for example the gear z36 got certified recently), see new parts showing up and lets you know how active we actually are! But I'm seeing that I have babbled enough for now again, heh.